The round boulders in Koutu are to be found along the coastline towards Onoke. 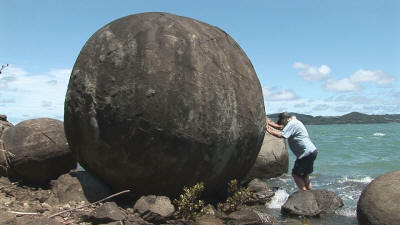 Their size is many times the size of the so well known Moeraki boulders. This hidden treasure is not easy to be found. They are only accessible at low tide by walking on the sand along the shore. Wait until the local bowling club discovers them, you will have to duck for cover. Seals come into the Harbour to winter and to get over injuries sustained at sea. Four survivors of the abortive Rosana expedition moved down river to Koutumongero near Opononi, now known simply as Koutu. Their names were McLean, Nimmo, Giles and Nesbitt, and in spite of Marmons comings and goings, they may have been among the first independent permanent settlers on the river, although Nesbitt subsequently went to the Bay of Islands. In 1828 Captain Kent purchased Koutumongero for Captain Young who took possession in 1831. Captain Young purchased 640 acres at Waihou in 1833, and was the first to purchase land at Opononi, where for Sixty nine Pounds thirteen shillings he acquired 41 acres in 1835. Pakeha-oriented chiefs Moetara, his brother Rangatira, Te Kahi and others, whose territory ranged from Pakanae in the Harbour, to Mauganui Bluff on the coast, raised an army and paddled up the river to Motukauri. One suspects that this reaction may not have been due so much to a devotion to law and order as the occurrence of an opportunity to settle old scores, but what ever the motive, this force landed at Motukauri, to be met by musket fire from the defenders. General fighting ensued, involving some twenty-two casualties. Moetara lost among others, the chiefs Te Kakahi, Pahau and Taungahuru, and the defenders two important chiefs,Mariao and Taku. Moetara then retreated with his forces to Captain Youngs cattle-run at Koutu (One Tree Point) and built a large Pa**, there enclosing Youngs house and buildings, to protect them and his people from any counter-measures that the Motokauri or Whirinaki Maori might take. Munitions poured into this fortress where the activity was being supervised by our warrior-Tohunga Te Waenga, alias Te Manene. Sadly though, he got close to an accidental gunpowder explosion, which terminated his eventful career. Reinforcements crowded into Koutu, they included Jacky Marmon, who came with Nene (Tamati Waaka) and his brother, and 300 men. Marmon and about thirty of Nenes people crossed the river and fired into Orogtea Pa, which was occupied by some Rarawa, but little harm came of this. The whole episode then ended tamely when the Koutu army demanded the Fortitude’s papers, and got them. Honor being now apparently satisfied, all parties dispersed, and on the 3rd May the Fortitude refloated and left the harbour little worse for its harrowing experience. The Pa site, can be sighted by Jim Mathews farm towards the end on Koutu Point, now cleaned up to become an over night stop for camper vans. Jim’s farm, historically known as One Tree Point – the name deriving from the gallows – tree on which slaughtered cattle were hung. In 1831 Young had stocked the land with sheep and cattle, but only cattle thrived, the sheep being fair game for local dogs, still a problem to this day. 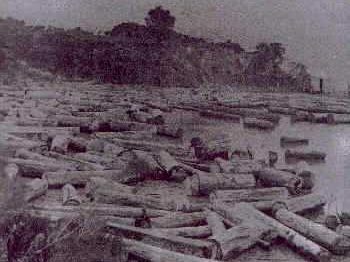 The New Zealand Timber Company Mill at Koutu, Hokianga Harbour was at the time one of the most up to date and the largest sawmill, said to be the only band saw mill cutting kauri timber. It produced 3,200,000 feet of board annually but its capacity was 9,000,000 feet. 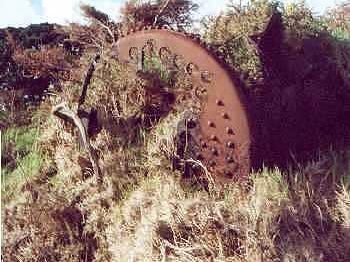 Remanants of the boiler -still laying in the paddock- was for the steam engine. 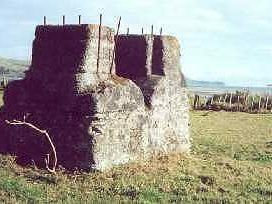 This part - still standing in the paddock - was most probably a part of the boiler house. In 1834 the Brazil Packet sailed into the Hokianga. 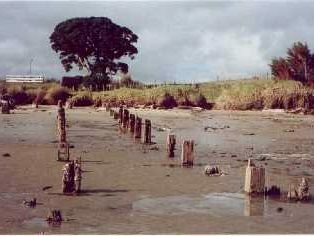 The captain, Crowe later acquired a Kauri Forest in Moeteras territory near Pakanae, where he engaged sawyers to cut the timber and stack it at Captain Young’s place at One Tree Point (Koutu). At the end of 1836 Crowe called with his vessel to load the timber, but his sawyers refused to raft it out to his ship until a dispute was resolved on the interpretation of their agreement with him. * However, in the spirit now firmly entrenched in New Zealand industrial relations, Crowe announced that he would load the timber whether they liked it or not. Thus, in effect, a confrontation loomed between the two most powerful groups in the Harbour. Crowe, at his timber stacks, was undoubtedly in place there, but Moeteras people, his allies, ‘ lingered with their arms in the immediate neighbourhood, refusing to interfere unless Crowe or some of his party were fired upon’. Observing this, the riverside army no doubt became painfully aware that it was operating in hostile territory, and that a battle might result in which they could get severely mauled. At last, therefore, they settled for burning Crowe’s timber-stacks, a solution that probably appealed to the keen Maori sense of justice on both sides. They then re-embarked, and with their flotilla returned up the harbour. The timber involved was no doubt from land at or North of Pakanae, purchased by Crowe in 1835, but which later reverted to the crown. Crowe himself survived this episode by only six months or so, suffering the common fate of drowning in the river in May 1837. How McDonnell got implicated in this abortive war is not clear. At this stage he had been divested of such nebulous authority as had been vested in him by his appointment, and White believed him to have been involved in the raising of the sawyers army - perhaps in the hope of eliminating a competitor. Whatever the reason, White is said to have induced Nene to arrest McDonnell in order to send him to Sydney for trial for his complicity in the matter. But the ex-resident, apparently aware of this, threatened armed resistance and Nene, who had been laying in wait for him at Horeke, discouraged by this turn of events, abandoned his ambush. So the Plank furore lapsed without further hostilities. * Reputed to be the first industrial action in New Zealand.